Google brought us the Pixel Chromebook back in 2013, and now, it looks like Android 6.0 Marshmallow will be co-opting the name. And it all starts with a new tablet called the Pixel C.
The new tab has all the Pixel aesthetics you’re familiar with: aluminum design, no exposed screws—just good looking. But its best feature is the optional $150 keyboard held together with self-aligning magnets so powerful you can hold the thing upside down and it won’t fall apart. The 10.2-inch, 2560x1800 screen (308 ppi) can then adjust anywhere from 100 to 135 degrees. At this point, you should be experiencing whole bunches of deja vu. Microsoft Surface? Maybe even the newer iPad Pro? The big difference also being ChromeOS is completely absent on a Pixel device. This is just Android. Google’s goal with Pixel C is probably to get tablets front and center at the workplace, or at the very least, seen as machines that go beyond pure consumption but can also get stuff done, too. Google has had the software with Android, but never had an in-house hardware platform. The Pixel C could be that very vehicle. Like many tablet hybrids out there, say you want to switch to a keyboard to send a long email or write a document. Well, with the Pixel C (the c stands for “convertible”), you slide the tablet, flip it, and prop it up on the back, no kickstand or clasp required. Then use the thing like a laptop. The keyboard connects via Bluetooth, and it all seems super sturdy. The keyboard also lasts two months of average use on a single charge, but the tablet charges the keyboard inductively when its closed. In order to better marry computer qualities with a tablet, the pitch of the keyboard’s keys are similar to those on a laptop: meaning, the keys are spaced out the same distance. The Pixel team explains that they fit the keys on the keyboard this way by pushing lesser-used symbol keys on the perimeter further to the side. The Pixel C connects and charges with the USB-Type C connector that’s being fully integrated into the Google ecosystem across devices, including the new Nexus smartphones. Finally, Google also added four microphones to let you input voice commands from across the room. 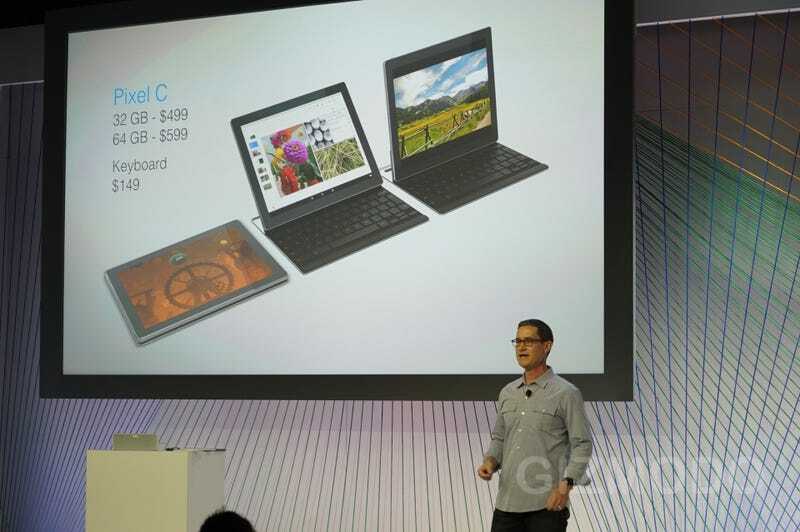 That keyboard costs $150 while the tablet itself costs $500 for 32GB and $600 for 64GB. It will be available for the holidays (of course).